Wedding PR: TravelPulse, United With Love, Brides, and more! We are thrilled to share this great roundup of client press features, with outlets like TravelPulse, United With Love, Brides.com and more! 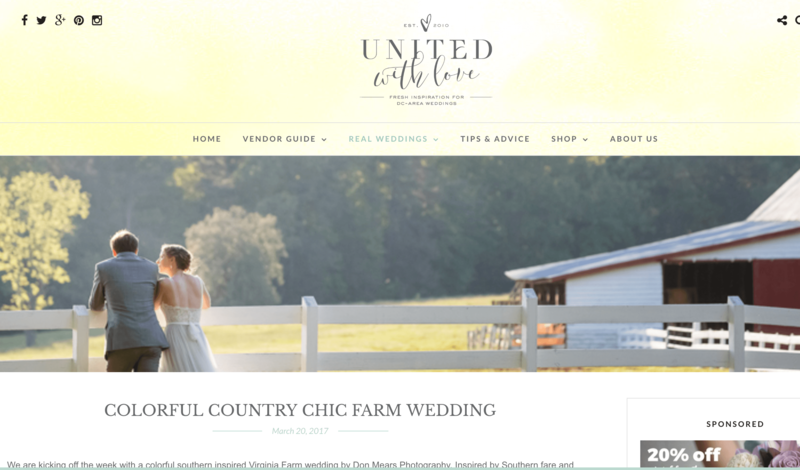 Don Mears Photography was featured on United With Love with their real wedding, Colorful Country Chic Farm Wedding. See the full feature here. Cocoon Events Management Group and the International Academy of Wedding & Event Planning were featured on the Huffington Post in the article, Luxury Wedding Inspiration to Use in Your Own Celebration. See the full feature here. All Inclusive Outlet was featured on TravelPulse in the article, Travel Tips for Grandparents. See the full feature here. Sunshower Photography was featured on PartySlate with their real wedding, Gracie and Brandon’s Industrial Chic Charlotte Celebration. See the full feature here. Wente Vineyards was featured on Brides.com in the article, Your Go-To Guide to Pulling Off the Perfect Wedding Dessert. See the full feature here. The International Academy of Wedding and Event Planning was featured on Brides.com in the article, Marble Wedding Details That Are Beyond Gorgeous. See the full feature here. Where Will They Stay? and Stephanie Yonce Photography was featured on AllSeated in the article, Room Blocks for Your Wedding: What You Need to Know. See the full feature here. Destination Weddings Travel Group was featured on TravelPulse in the article, Travel Agents’ Guide to the Perfect Honeymoon. See the full feature here.